You aren’t doing much if you don’t grapple with uncertainty. 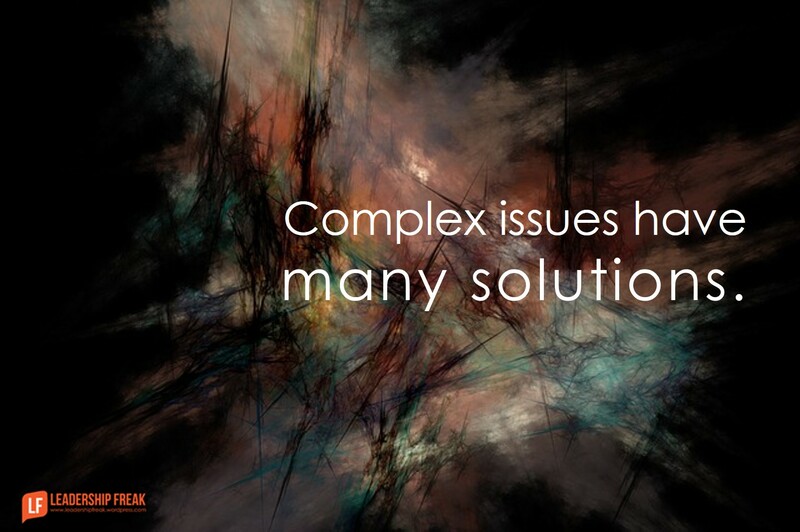 Complex issues have many solutions. Thinking otherwise closes minds. Closed minds damage organizations and limit leaders. Avoid the appeal of first suggestions. Elevate stress. If there is only one right solution, everything else is wrong. Inspire adversarial relationships that end with winners and losers. Waste energy creating perfection. The pursuit of perfection is noble; waiting for perfection is sabotage. Make either/or decisions, when “and” serves better. The first sign of wisdom is the pursuit of wisdom. Wise leaders deal with uncertainty by actively seeking alternatives. #1. Acknowledge the tendency to fall into intellectual ditches. Old patterns become habits. Habits become easy answers. Easy answers feel comfortable. Explain purpose. The most important aspect of decision-making is to understand the purpose of the decision. What are you really trying to accomplish? Seek several alternatives. Design four options before making one important decision. #3. Include new people. The answer to many challenges is “who” not “what”. New ideas emerge from new people. #4. Create safe zones where making suggestions is honored, not punished or ridiculed. Say thank you when alternative are offered. Explore how new ideas might work before quickly ruling them out. Say, “And, what else,” after suggestions are offered. #5. Expect all team members to speak up. Speak up or step down. Beware of team members who speak after, not in, meetings. Where patterns of non-participation prevail, replace old teammates with new. How might leaders come out ahead in complex situations? Thanks Karen! I respect your readership and participation. Do come back again. This is an interesting subject, and one that is little understood from the perspective of the intrapersonal tensions that intersect with how one deals with ambiguity and makes important decisions. Not to make a crass commercial message here, but in our research of effective turnaround leaders we have identified two statistically significant differences between effective and ineffective leaders when it comes to decisionmaking. Contrary to what one might expect, the most effective leaders are comparatively slow making important decisions. They are comfortable with ambiguity and take ample time to game out various decision options, seek wise counsel, stare out the window and meditate/pray about the issues. In contrast, less effective leaders tend to make decisions more quickly and with less input from others. (Our theory is that this is due to their discomfort with ambiguity, but our research has not proven that as it was not an original object of study). In our mentoring process, we work with the “ready, fire, aim” decision makers to (a) probe reasons for their discomfort with ambiguity – akin to item #1 above; (b) identify appropriate colleagues and counselors who should become part of their decision making process – akin to item #5. We also teach them an exercise which we call “the rule of 3”. For each important decision they must identify 3 viable options and then game those options out to project probable outcomes. This requires them to slow down, to include others, and to lean into the unknown. Only then are they ready to make a good decision. So far the results have been quite promising. Again, sorry if this comes across as a crass commercial message. My hope was to contribute to the discussion and suggest one possible way forward for those who struggle in this area. Always remember General Patton’s advice that a good plan execute now beats a perfect plan sometime never. “If we do this is it better than what we do now?” It doesn’t have to be perfect, just better. “Does it leave us room to change/alter down the line?” Make sure it isn’t a dead end! thanks Dan. I think my favorite part is the very last line about exercising some caution regarding leaders who are silent during the meeting…. but have meetings after the meeting. That feels like divisiveness to me and I think it is dangerous to teamwork and collaboration – it is not servant leadership. I think part of the action in that instance is to hold folks accountable for the behavior and setting clear expectations.